You know how on Star Trek there is a mirror universe where mankind is basically evil and warlike? Well, LINE (sometimes romanised as "Raine" or "Rayn" or "Rhein") is essentially the mirror universe version of Ultraman. Everything is really weird in it. Arai, the secret identity of Line, is a member of SAM, Special Arms Members, your usual Science Patrol thing. 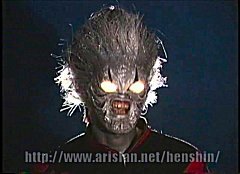 But Arai is really a demon, who first turns into a horrible looking thing and then immediately becomes Line, who looks like an evil Ultraman. 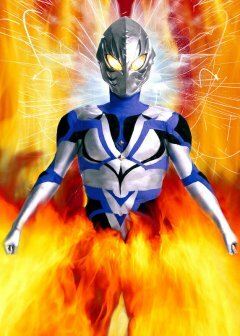 The problem is that he IS an evil Ultraman. 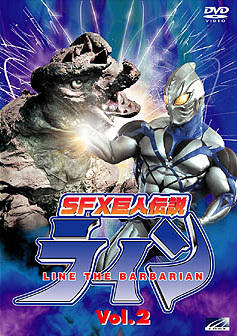 In the first episode a monster appears and he transforms to fight it. Unfortunately once the monster is killed, Line loses all self control and assumes "Barbarian Mode": his body becomes extra muscular, like Schwarznegger in his heyday, and he starts himself destroying the city and killing civilians. He squashed humans under his foot like bugs. One member of SAM, a girl who dresses like Rambo, has to shoot him with a special weapon to keep him from destroying the city. This is one strange show. It's shot on video, has 90s hair styles and make-up. Yes, make-up. The men all wear strong glam-rock make-up. Arai himself looks like a hair band member. And the soundtrack is very 80s. There are moments which are absolutely hilarious in this...Line strikes with a scream resembling something from a Michael Jackson performance. This would make sense considering the time period. But it is all so strange. I can't rate this show at all, because it is in a class of its own. Do I like it? I love it, but I think I'd like it more if I could watch it with a bunch of people and laugh at it. I keep bursting into laughter due to the show's unconventionality. In episode 2, the Rambo girl is sitting in a gay bar having a few drinks with some transvestites when some Village People-rejects drop in and start picking on her. Re-read the previous sentence and you'll understand that this show...is...REALLY weird. The DVDs have extras, a "making of" documentary full of outtakes, plus a music video of the theme song being performed by the Arai actor. Interestingly, Rambo girl also doubles as some of the monsters in some scenes. In one shot we see she is the Line suit actress on occasion, although the Arai actor is the one who plays Line the most. Arai's love interest is Yabuki, a girl he saved from a monster years before and who later joined SAM. The girl has Austin Powers teeth and it's hilarious when she points at a monster offscreen with this totally silly expression on her face. Rambo Girl Tatsumi cares for Arai like a brother. She proves this by occasionally mashing his face to a bloody pulp. Arai loves Rambo girl like an older sister...or brother...in her case it's hard to tell. Arai shows his devotion to her by...well..occasionally mashing her face to a bloody pulp. The communications officer of SAM is a gay MENUDO reject named Hoshino, who likes to give the male officers shoulder massages. He wears a lot of make-up. The captain is virtually non-existent. He appears to shout a couple words then disappears. Maybe he's avoiding Hoshino. Chroma-key composite FX like this are the norm in LINE. There's good stuff in this show if you watch enough episodes. Some episodes are brilliant, others have scenes that drag on too long. The pictures of graphs were replaced with pictures of the monster and the words Cloud and Clouds were replaced with the word SEAKONG (apparently that was the monster's name in pre-production) throughout the page. This episode guest starred Hotaru Yukijiro, who played inspector Osako in all 4 Heisei GAMERA films (the fourth one being a fan film). Here he appears to be playing the same character! There is some connection between LINE and the fan film GAMERA 4:TRUTH. LINE was produced by Rapid Progress, responsible for ASSAULTMAN. One of the monsters in ASSAULTMAN is the very slightly modified Gamera suit used in G4T. Red Kong, by the way, is a giant angry gorilla who is addicted to bellydancing. Unfortunately when he dances he destroys the whole town. He is NOT red. His eyeballs are white, just like Godzilla's in the Godzilla movie directed by Gamera trilogy director Kaneko. There's some great, fun stuff in this series. Episode 6 shows a Pigmon/Garamon type monster who befriends a drunken bar pianist. The pianist, a girl with a ridiculous blonde wig (which she likes to put on the monster), can only speak english, which leads to the rest of the cast trying to communicate with her in completely incomprehensible bursts of engrish. This episode pays hommage to the Ultraman episode where Ultraman tries to tie a monster to a rocket. Episode 9 pays hommage to the Bruce Lee fiasco "Game of Death", with Arai dressed up as Lee in that yellow jumpsuit with black stripe later worn by Uma Thurman in Kill Bill. It is the most openly comedic episode, with Tooth Lady playing dual roles. 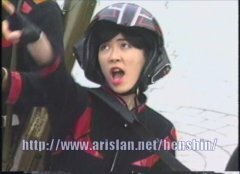 Episodes 10 and 11 are a single two-part story in which Arai punches out an army general and impersonates him to command an attack on a giant crab that can only walk forward. The cliffhanger at the end of part 1 is actually pretty interesting. Too bad part 2 spends about 10 minutes in the kitchen of the army camp where two soldiers on KP duty spend their time arguing. Those two guys aren't even series regulars so I am thinking they were popular comedians in Japan, doing a routine. 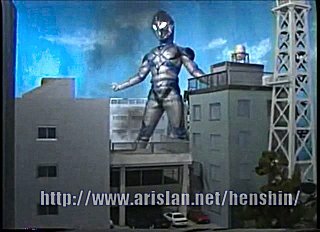 Episode 12 deals with Baltan from Ultraman. They come to Earth again and are easily disposed of. 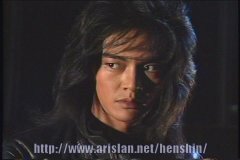 Not very good, but it's always nice to see Baltan seijin even if they renamed him Baltex Alien. The suit is practically the same, the multiple-baltan effect is there too. I can't remember if it's the episode before the one where the General of the JSDF kisses and hugs the Bruce Lee wannabe. I know it's after the one where that same general destroys his own desk and starts complimenting SAM on their job. There was another officer of the JSDF in the final episode who talks so much that the captain of SAM falls asleep standing up during debriefing. . The special effects in Line are not always very good. They repeat a lot of crowd scenes and a lot of the green screen FX shots. Expect a lot of video-quality effects, like those made with a video toaster. 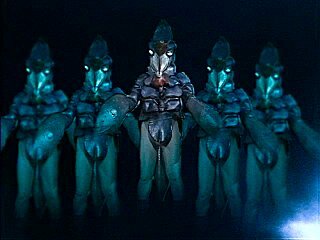 The monster suits are not of consistent quality, some are good, some are pretty bad. Rapid Progress apparently rents out the suits for special events and parties. Line's muscle suit was duplicated and made into a villain in ASSAULTMAN and ASSAULTRISER, original videos by the same company, using some of the same actors. There are miniature buildings to destroy but Line tends to get chroma-keyed into background footage of real cities. Unfortunately that too gets re-used quite a bit. 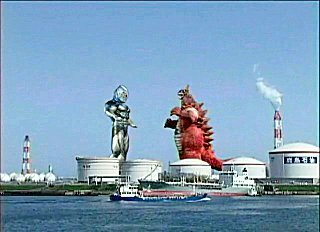 The first monster fight is a bit disappointing, the monster suit looks like it is falling apart and Line doesn't know what to do with his hands. He starts off in regular mode, which looks like Ultraman. Then he upgrades to steroid mode. 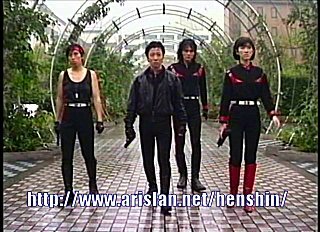 Later in the series this was abandoned in favour of a one step henshin, like Inazuman Flash. The DVDs I got the entire set new from JUNGLE. They had the whole set, region 2, in stock for a fraction of the usual price. I think I got the last one because now they only sell the individual DVDs at retail. DVD 1 comes with a collector's box, then you add in #2, #3 and #4. Similar to what Funimation did in America with Ultraman Tiga. Each DVD has 3 episodes, except for #4 which has 4. The menus include access to special features such as really cool "Making of" segments, monster designs, and photo galleries. A great job on the DVD authoring. It's too bad a couple episodes have issues with sound, but that was a problem in the original episodes audio design, not the fault of the DVDs. One minor issue in DVD #3 was that I was unable to advance through chapters. The episodes were organised by title rather than chapter. It might haven been just me. Only real flaw: no english subs, although english is spoken a lot in episode 6, "Stand by me".